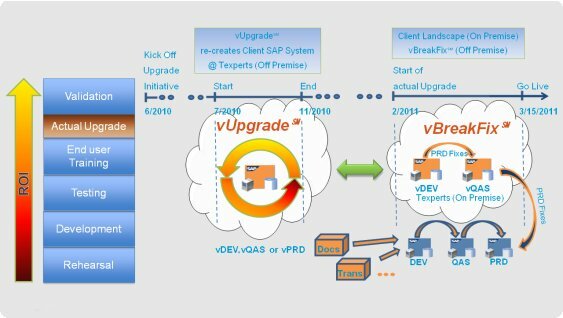 vUpgrade is a new cost effective way to accelerate your SAP Upgrades while saving time, money, and without the usual infrastructural commitments on man hours and resources. vBreakFix can be used in conjunction with vUpgrade, but is a powerful standalone tool that can be leveraged by any company performing a SAP Upgrade. With vBreakFix we are able to maintain a production support path for your landscape all the way up until the time the production servers themselves are upgraded in a cost effective manner, which would normally require the acquisition of additional hardware and infrastructural support. To learn more about these services click on the links below. 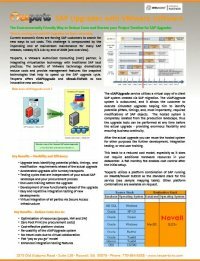 As a leader in the SAP Virtualization field, Texperts has realized the enormous power of Virtualization and is leveraging it to help our customers. 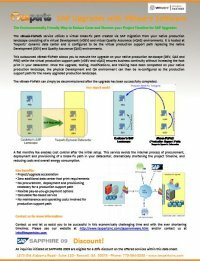 With Virtualization we are able to accelerate SAP upgrades with the use of several different tools/processes that can be utilized individually or combined for an optimal solution.